While the new Nissan Pathfinder SUV and the Leaf drivetrain-based electric e-NV200, the Japanese automaker brought out the new, more powerful 2013 Nissan GT-R supercar and today, the company announced that the 2013 GT-R will come with a much bigger price for the next model year. Those looking to buy a 2013 Nissan GT-R get to pick from two packages – the GT-R Premium and the GT-R Black Edition. The “entry level” 2013 GT-R Premium carries a starting price of $96,820 while the top of the line GT-R Black Edition starts at $106,320 for US buyers. That means that the 2013 Nissan GT-R Premium starting price has increased by $6,870 over the 2012 MSRP of $89,950 while the high end GT-R Black Edition gets an even bigger jump of $11,220 over the 2012 price of $95,100. The 2013 Nissan GT-R is powered by the same 3.8L twin turbocharged V6 sending the power to all four wheels via a 6-speed dual clutch transmission and Nissan’s advanced ATTESA E-TS all-wheel drive system. 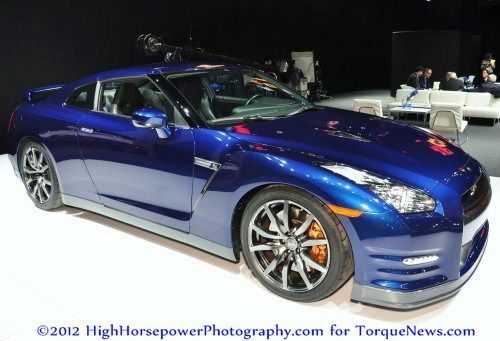 For the 2013 model year, the power output has been increased from 530 horsepower and 448lb-ft of torque to 545hp and 463lb-ft of torque – increases of 15 horsepower and 15lb-ft of torque over the previous model year GT-R. Other than that increase in power, which Nissan claims allows the 2013 GT-R to rip from 0 to 60 miles per hour in just 2.7 seconds, the only other change for 2013 is a new dry carbon rear spoiler for the Black Edition models. These price increases of $6,870 to $11,220 for American buyers looking to park a 2013 Nissan GT-R in their garage might seem like a hefty chunk of change for 15 horsepower, 15lb-ft of torque and a new rear spoiler but Nissan is quick to point out that the GT-R is still among the best performing cars in the world. For $96,820, the 2013 Nissan GT-R Premium still comfortably outperforms a great many supercars from all around the world that cost substantially more and when you consider just the most basic numbers of 0-60 times, the 2013 GT-R is only 2 tenths of a second slower than the 1,001 horsepower Bugatti Veyron that will set you back at least a million dollars (and its out of production). The closest current production model in terms of 0-60 time is the Porsche 911 Turbo S that also dashes from a dead stop to 60mph in 2.7 seconds but it carries a price of over $160,000…so the 2013 Nissan GT-R is still a fair deal less expensive while also being able to do far more than just romp from 0-60 in a hurry. The Japanese version of the 2011 Nissan GT-R is among the fastest production cars in the world to lap the famous Nürburgring in Germany, turning in a time of 7:24 and ranking among the likes of the Chevrolet Corvette ZR1, the Porsche 911 GT2 RS, the Lexus LFA and the Dodge Viper SRT10 ACR. On top of that, we can expect that the 2013 model will at least be a touch quicker with an extra 15 horsepower and 15lb-ft of torque. Its incredible to see this kind of performance from Nissan at under 100k but does anyone rememer the original asking price of the already impressive 09 GTR with 485hsp? Uh..... I do. 65 K .